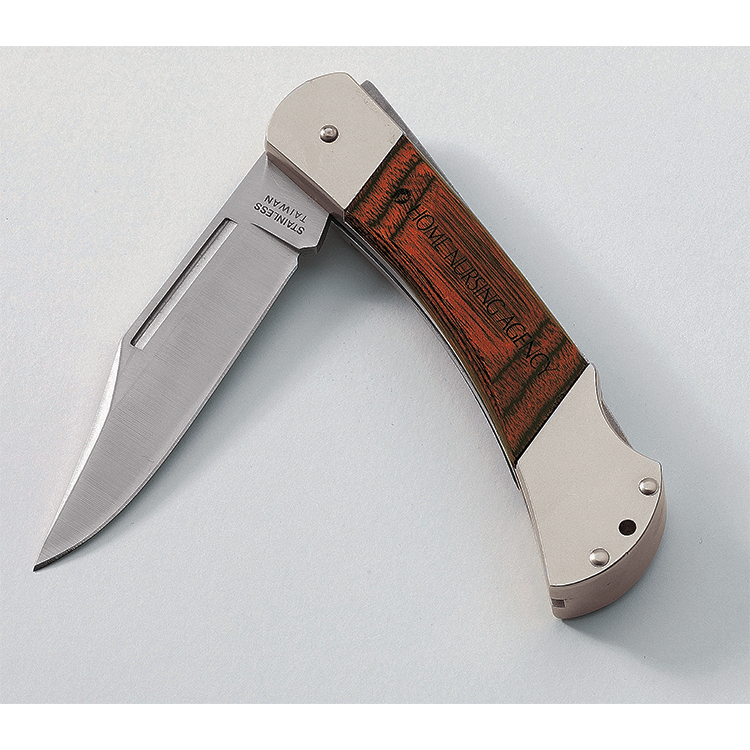 - New Stainless steel blade - even sharper AND stain resistant! 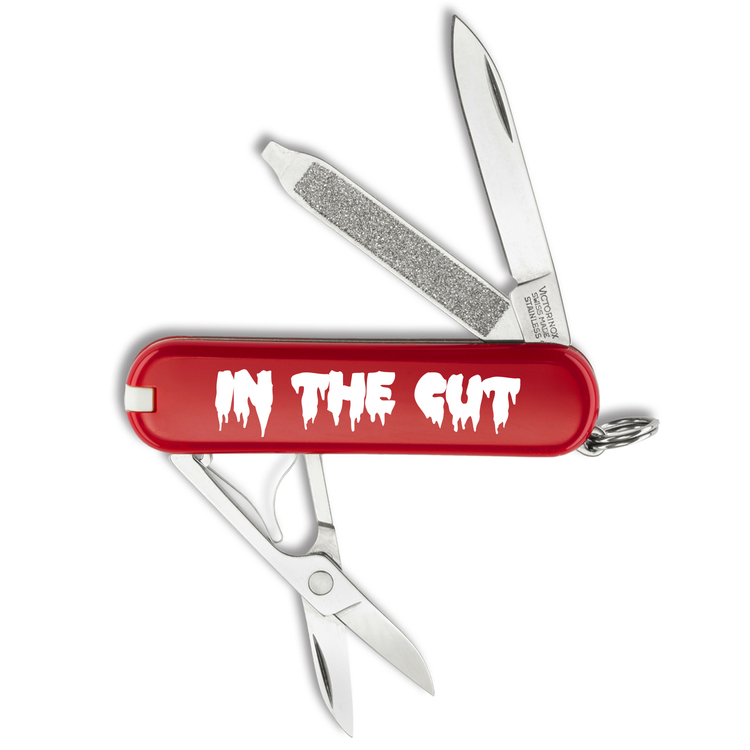 The perfect Utility Knife. 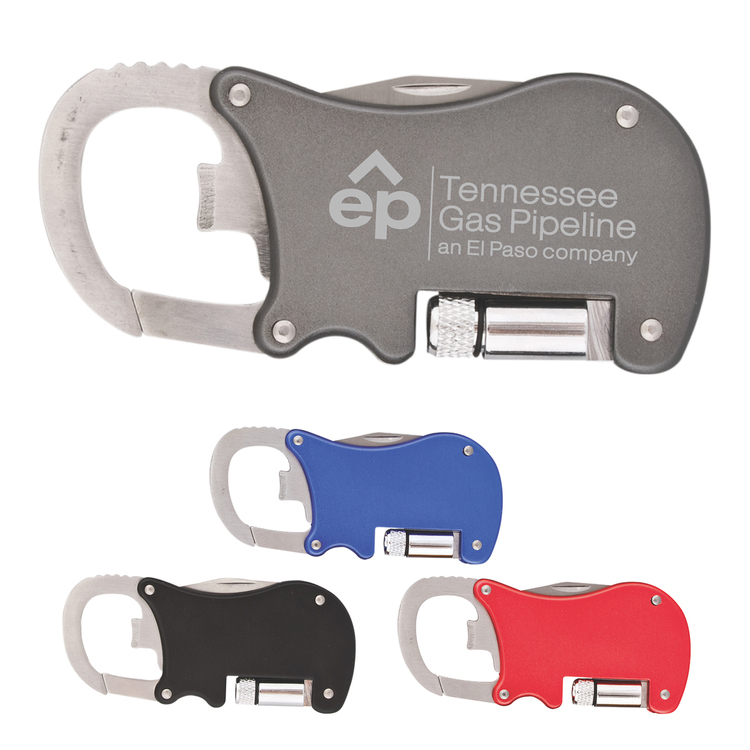 Great for home and shop giveaways. 3" anodized aluminum handle knife with 2" stainless steel blade and comes in gray gift box. 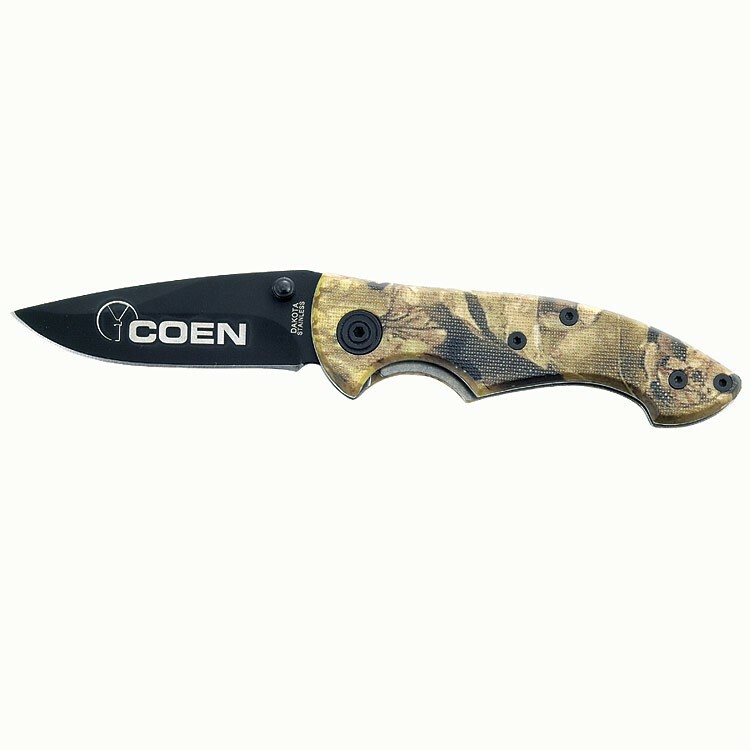 4 1/2" camouflage brown handle with 3 1/2" black stainless steel blade. Laser engraving on blade appears white and boxed. 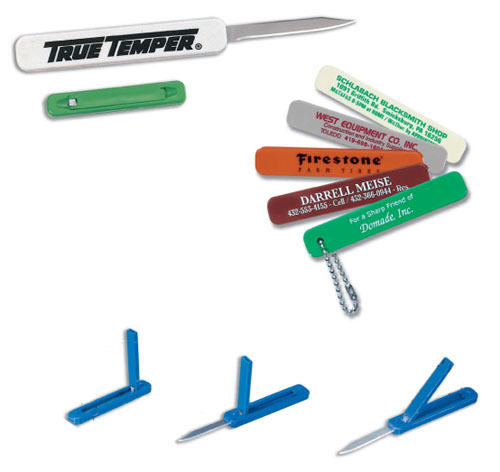 Needle nose pliers, screwdrivers, bottle opener, can opener, two knives, scaler and a lever tool. Carrying pouch with belt loop included. 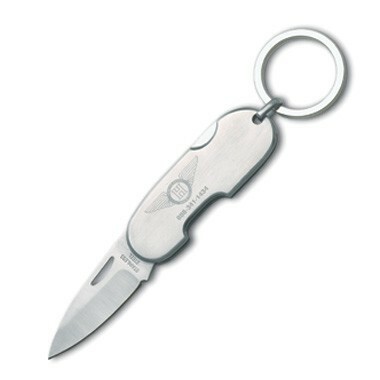 Description: Deluxe locking blade pocket knife with key ring. 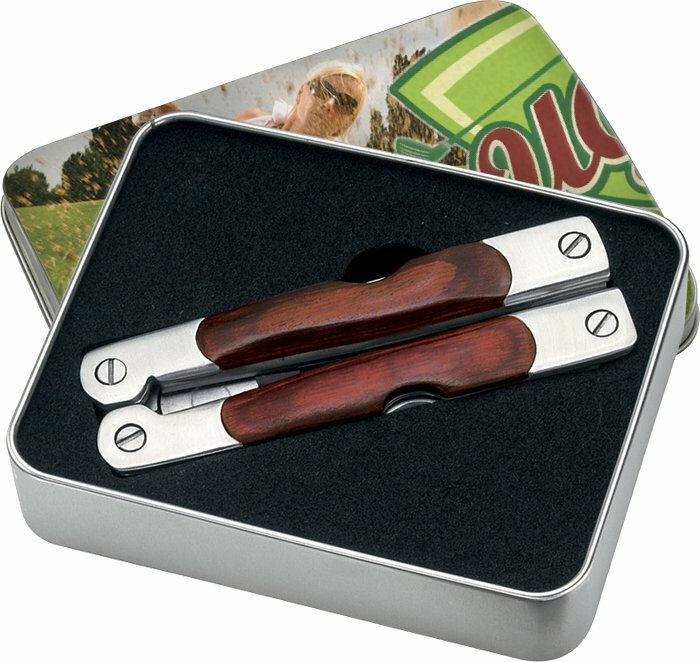 Material: stainless steel Color Available: Silver Measurement: 3" long when retracted Package: Gift Box Imprint Area: 3/8" x 1 3/4"
Description: 3 function pocket knife, stainless top or wood enamel (optional). Features scissors, knife, and nail file. 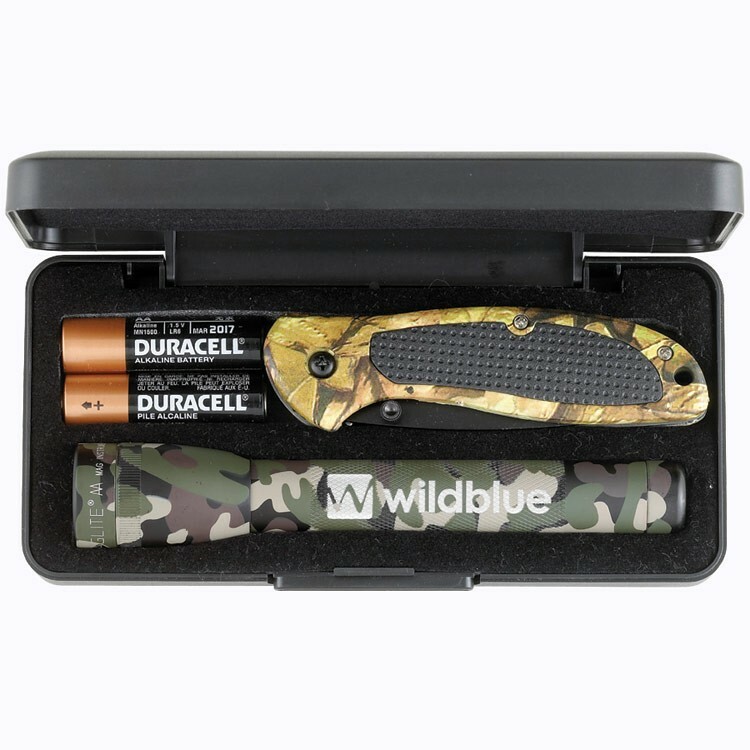 Material: stainless steel Color Available: Stainless Steel or Wood enamel Measurement: 2 1/4" x 3/4" x 1/4" Package: Gift box Imprint Area: 3/8" x 1 1/2"
This knife has a 4 1/2" camouflage green handle and 3" black stainless steel blade. Laser engraving on blade appears white, comes with clip and boxed. 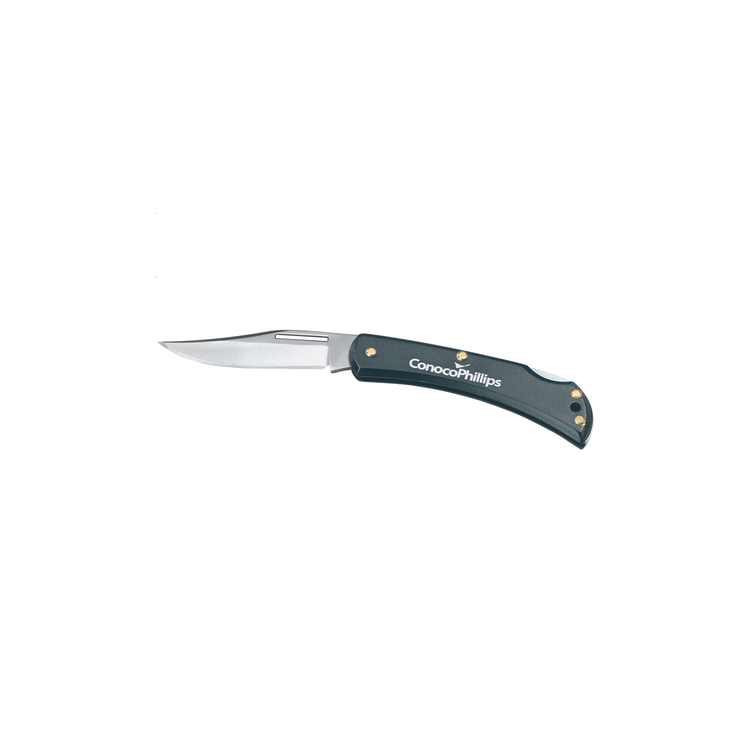 This knife has a 4 1/2" gray aluminum handle, 3" half serrated and black stainless steel blade. Features a glass breaker and seat belt cutter. 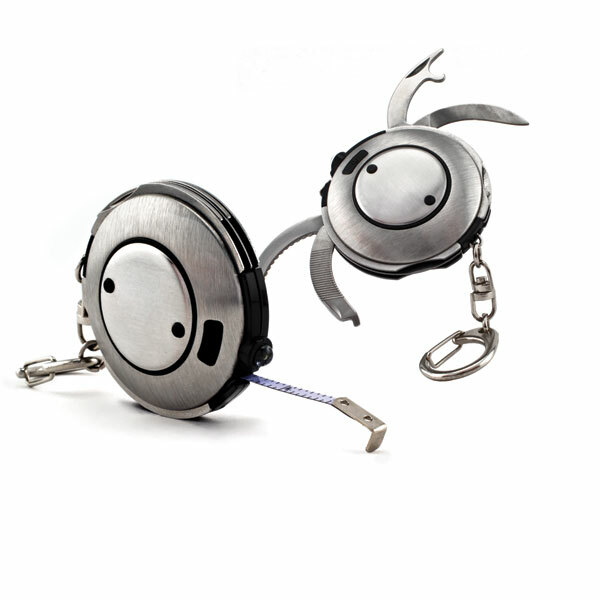 Assisted opener for easier use, comes with clip and boxed. 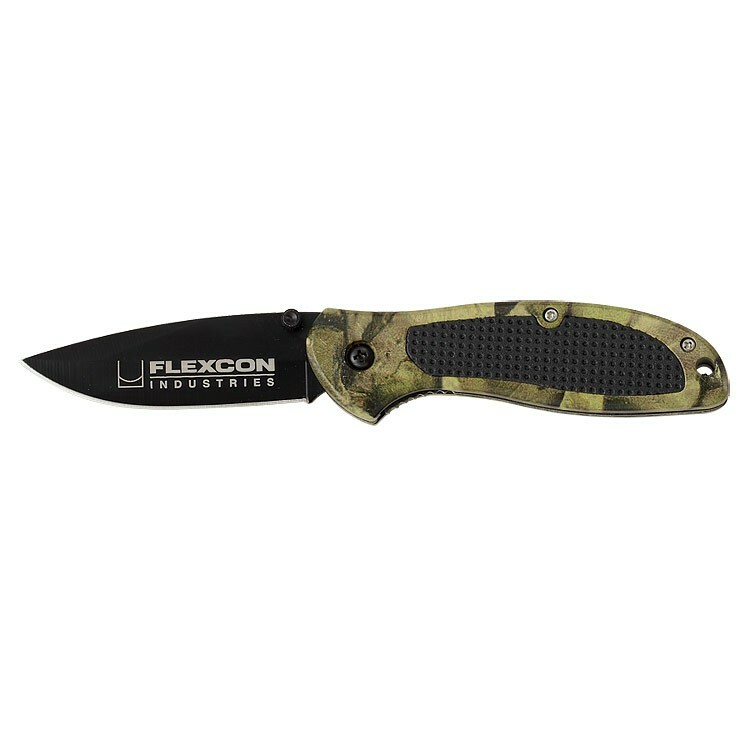 This knife has a 4" camouflage green ABS handle with rubber insert and 3" stainless steel blade with non-reflective coating. Laser engraving on blade appears white, comes with clip and boxed. 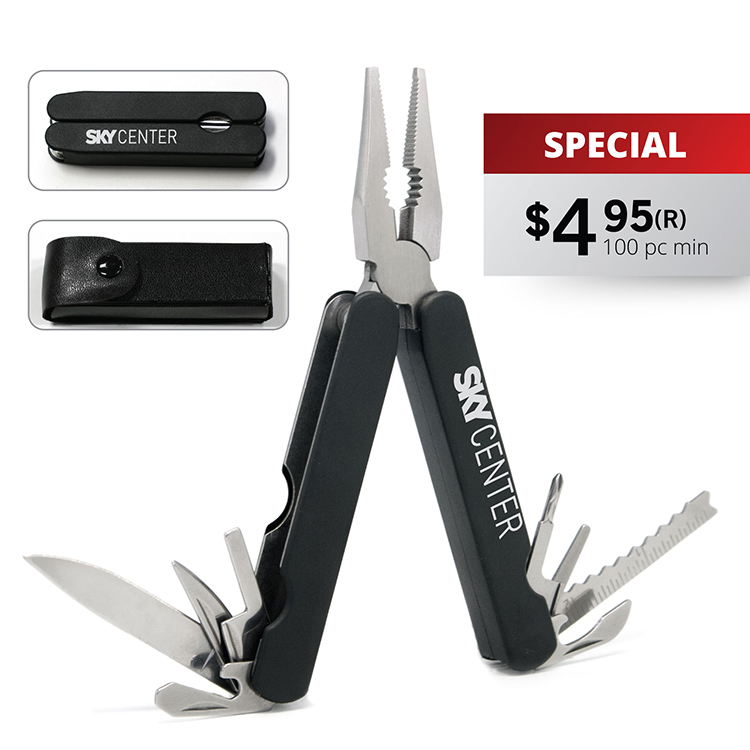 19 function tool includes can and bottle opener, Phillips head screw driver, 3 driver bits (2mm-4mm bits), three blades (3mm-5mm), serrated blade, pliers, needle nose pliers, wire cutter, and dual-function file. High-end non-stick easy care coating. Includes High Sierra Pouch. 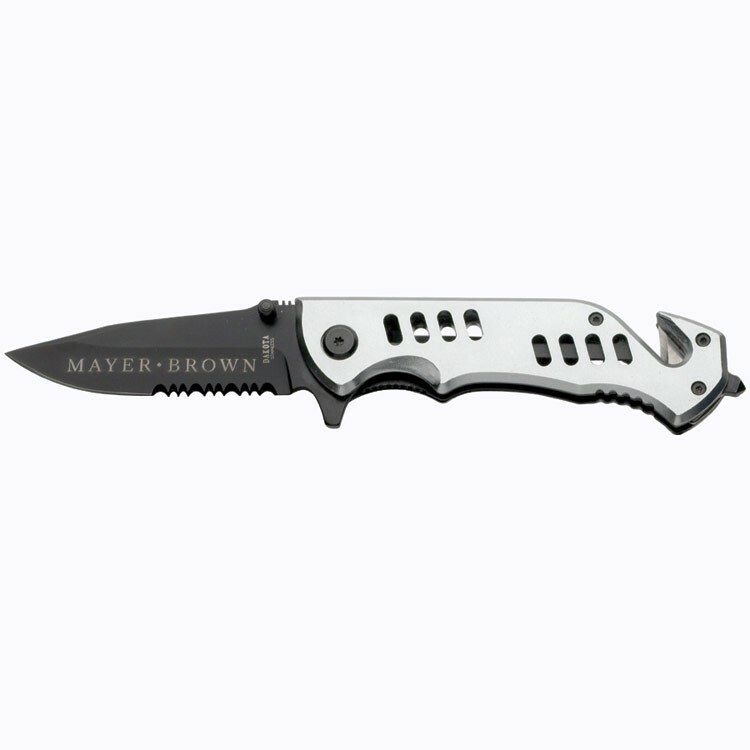 Description: Stainless steel pocket knife with locking blade. 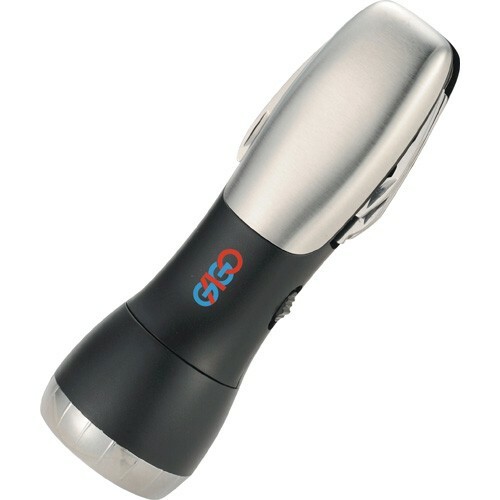 Material: stainless steel Color Available: Silver Measurement: 3" long when retracted Package: Gift Box Imprint Area: 3/8" x 2"
4 white LED lights and red flashing light function. Slide power switch to turn on/off and switch between functions. 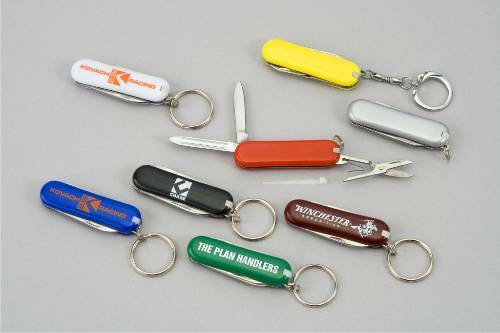 Stainless steel knife, bottle opener, nail file, flathead screwdriver with double hexagon wrench, fish scaler/hook remover, punch, saw blade/serrated knife, can opener and scissors. 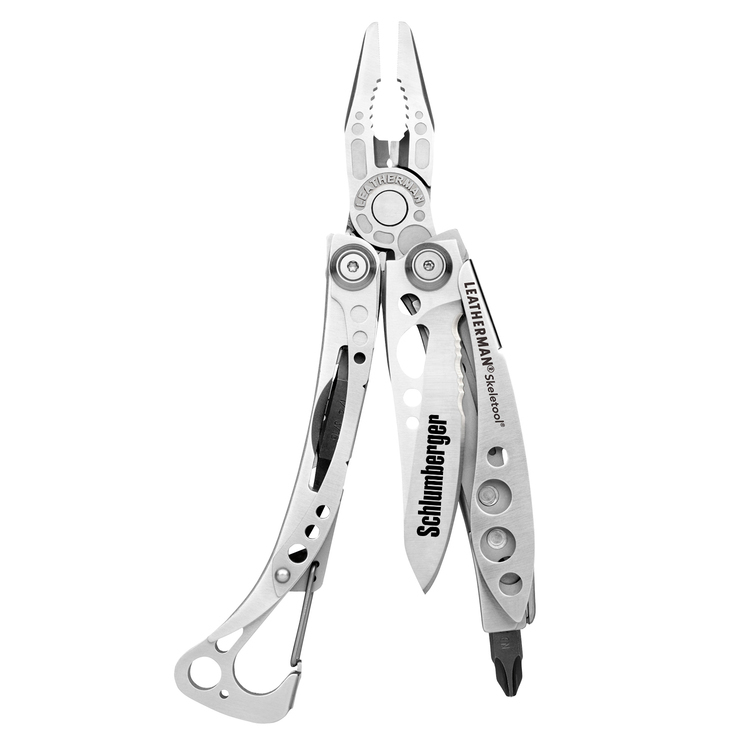 The handy style CS is one unique clip-on multi-tool. 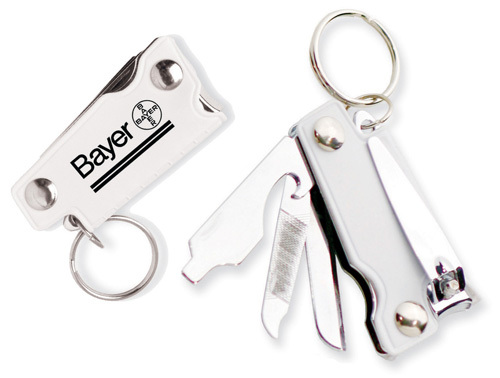 With spring-action scissors, a file, 420HC knife, tweezers, bottle opener and mini-screwdriver, you'll never be without your most necessary tools. 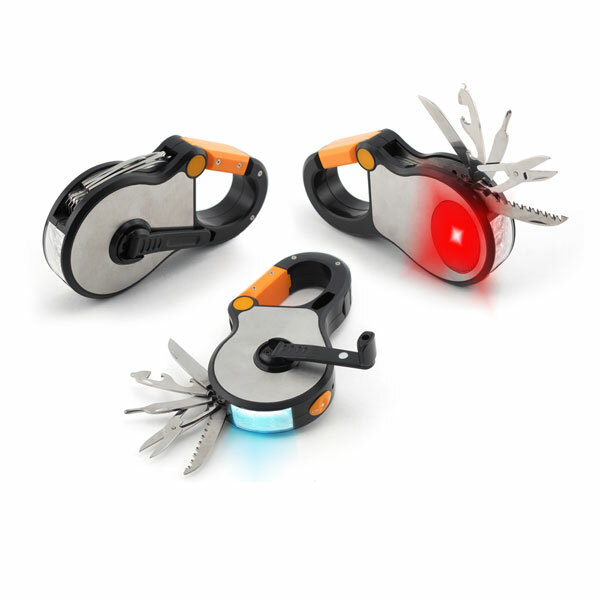 Fits in a pocket or use the carabiner clip to hook onto your pack or bag for easy portability. 3" closed, laser engraving on blade and boxed. 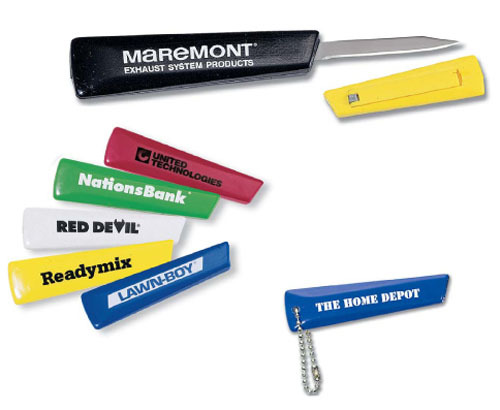 The most popular Victorinox® knife, 2 1/4" handle, includes blade, scissors, nail file with screwdriver tip, tweezers, toothpick and key ring and available in all colors. Perfect for home and shop giveaways. 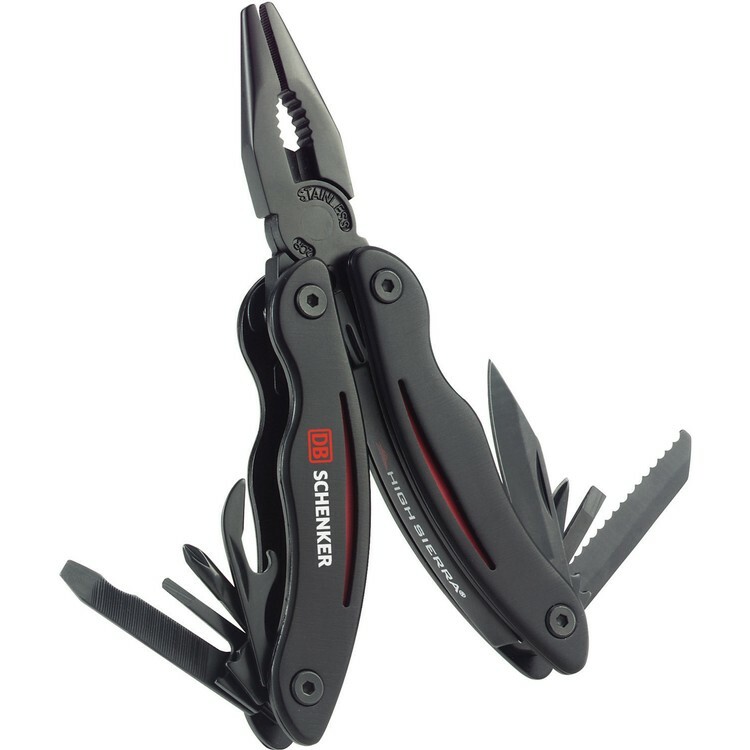 4" Closed, an amazing lightweight multi-tool that is half tool/half knife, features include needle-nose and regular pliers, wire cutters, hard-wire cutters, 420HC stainless steel blade, universal bit driver with bit storage in handle, carabiner/bottle opener and a removable pocket clip. 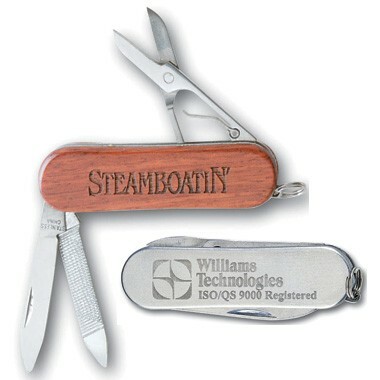 Comes with nylon sheath, boxed and engraving on main blade or top of handle. 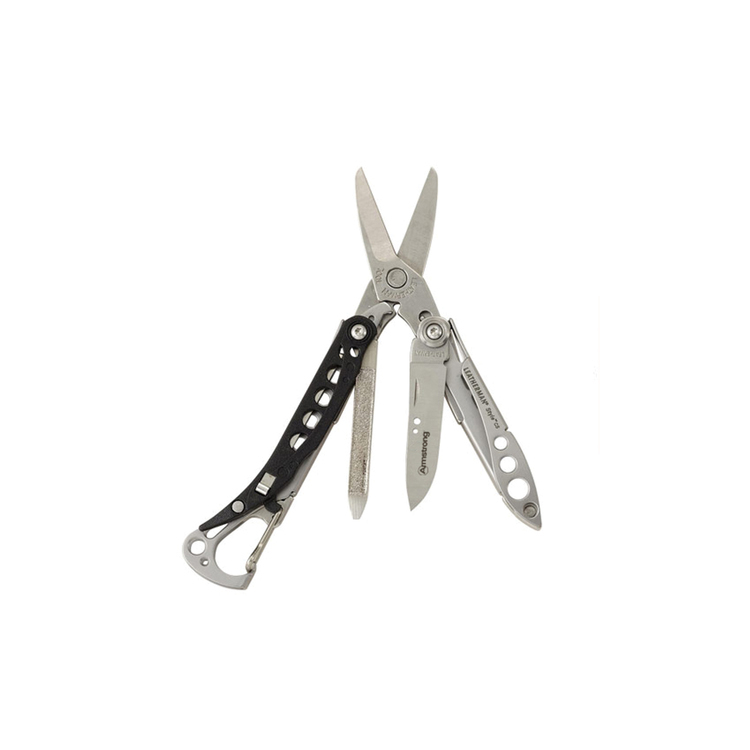 4" closed, an amazing lightweight multi-tool that is half tool/half knife. This tool has a tungsten DLC coating. 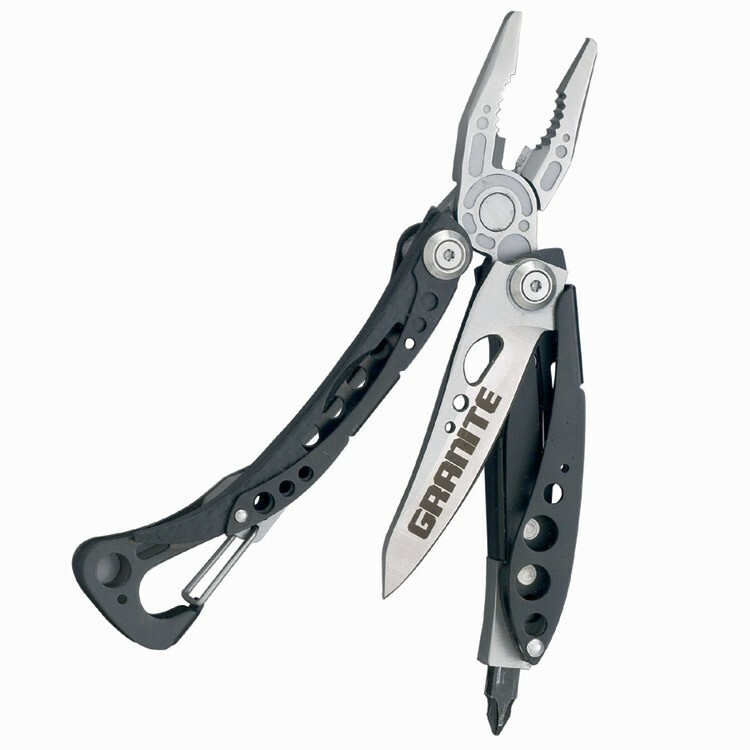 Features include needle-nose and regular pliers, wire cutters, hard-wire cutters, 154CM combination straight/ serrated blade, universal bit driver with bit storage in handle, carabiner/bottle opener and a removable pocket clip. 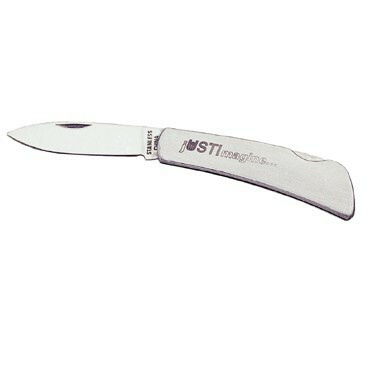 Comes with nylon sheath, boxed and engraving on main blade or top of handle. 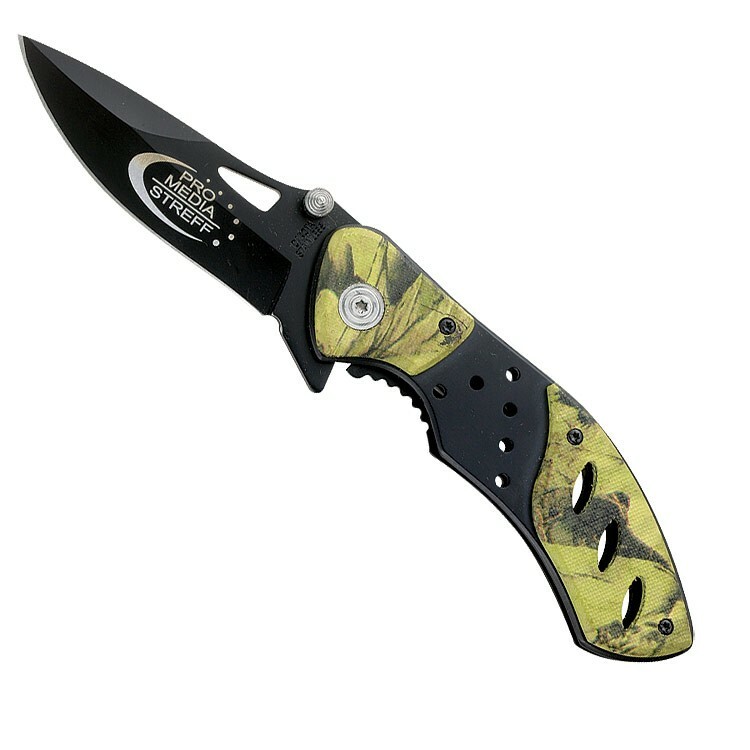 This knife has a 3 3/4" textured camouflage brown handle with 2 1/2" black stainless steel blade. Laser engraving on blade appears white, comes with clip and boxed. 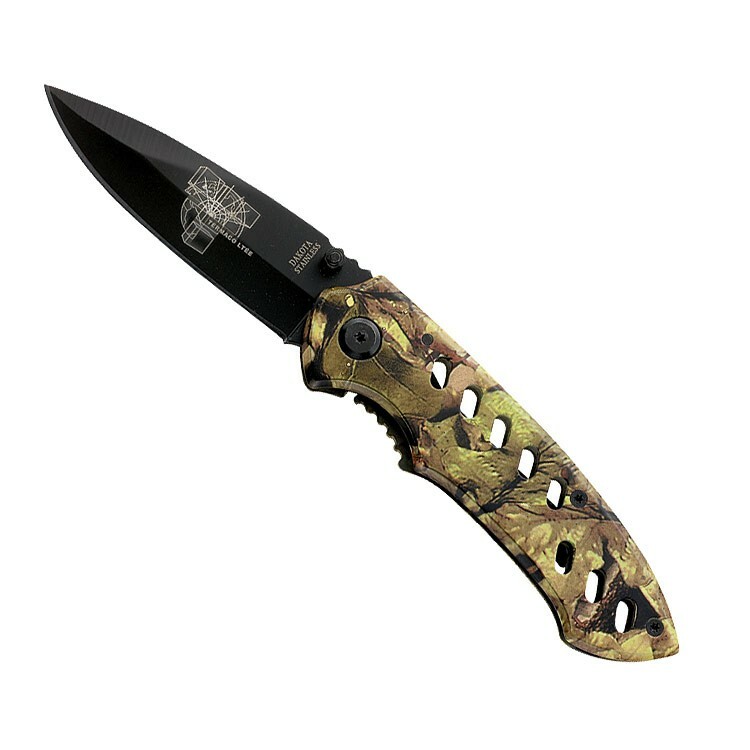 Mini MagLite® is 5 3/4" long and features a traditional leaf camouflage green design. 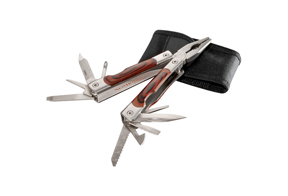 cougar pocket knife has 4" long handle and 3" black stainless steel blade, comes with 2 "AA" batteries in box. Knife Blade Imprint 1/2"x1 1/2"
4 1/2" black and camouflage green aluminum and G10 handle, 3" black stainless steel blade. Laser engraving on blade appears white, comes with clip and boxed.